If you’re like me, you’re doing more and more from your smartphone. At times, it may be the only “computer” available to you! That’s why we get excited when our resources develop ways to make them easier to use from smartphones and tablets. Then the diverse, reliable resources students and faculty need are there when you need them! EBSCO and JSTOR have had mobile-optimized versions of their platforms for a while. Now ProQuest has released one. You can find the link to ProQuest Mobile in the database records for each of the databases listed above or by going to “Selected Databases,” then “Other Mobilized Resources” on the library’s mobile site. 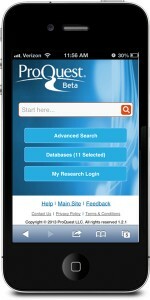 Once you have connected to the ProQuest mobile site, you can choose to search just one, all, or a combination of the eleven ProQuest databases. There is also an introductory video you can watch to learn more. Unfortunately, the mobile site does not display page images from the Vogue Archive on iPhones, because these images use Flash. Image used on library home page courtesy Francisco Osorio.